Discussion in 'Apple iPad News' started by iDan, Apr 15, 2010. Last night I noticed that â€œCats Love the iPadâ€ had suddenly and mysteriously appeared as one of Twitterâ€™s Top Ten Trending Topics. A little bit of investigation revealed a whole host of cute videos on You Tube of cats getting to grips with their ownerâ€™s iPads, with this one of a cat called Iggy probably being the most popular around the web. Check it out, itâ€™s just so cute! And if the thought of a catâ€™s claws scratching you iPadâ€™s screen up gives you the shivers, well Iggyâ€™s owner says that the screen is fine, and more than able to withstand Iggyâ€™s swipes. Actually Iâ€™d be more worried about Iggy knocking that cup of tea or whatever over, as any sort of liquid spill would probably cause a lot more damage that a catâ€™s claws. 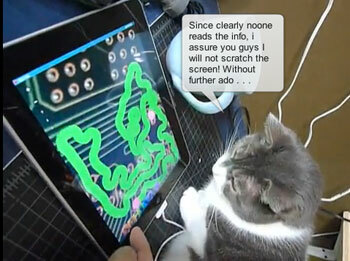 Good to see that cats are adapting to new technology too! Check out the video after the jump! Oh this is epic. LOL! Lol I saw that video it was sooo cute!